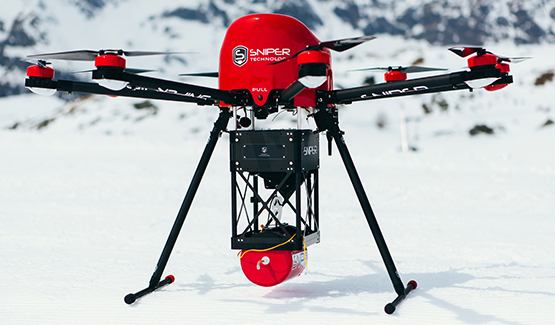 The only certified UAV for Prevention and avalanche blasting. 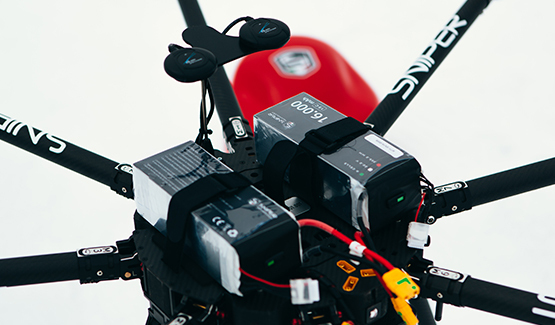 The combined use of the UAV with SNIPER System allows the ski areas and the mountain institutions to do an immediate intervention in case of necessity, ensuring a clear reduction of time for action. Moreover, the Drone is designed to allow an easy activation thanks to its arms and semi-automatic propellers. The use of this specific Drone with SNIPER System attached allows the blasting Team to work in total Security. As a matter of fact, the operators intervene from the default starting point, placed in a protected area, from where is possible to monitor the various steps of the mission. 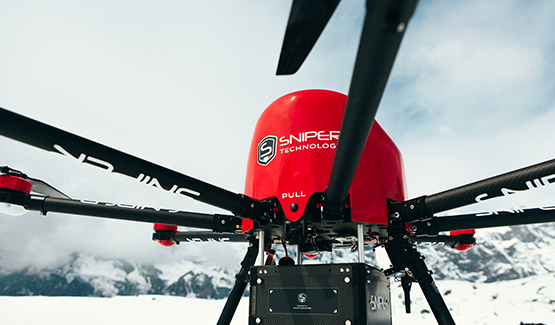 The combined use of the UAV, SNIPER System and SNP explosive allow to exert greater pressure on the snow surface than other traditional methods, thereby doubling the destabilizing efficacy on the snow cover and, as a consequence the efficacy of the blasting operations. 8 brushless motors strengthen and carbon propellers at high efficiency. Frame in carbon fibre, quickly foldable to simplify its transport. Telemetry datalink for flight information and remote management. Black box on buffer memory and registration of flight mission on memory card. Radio transmitter for drone control in manual or assisted mode. LCD 7’’ Monitor for preview on the ground of images and flight information OSD. GPS control: waypoint management software and flight parameters. To be able to pilot the Drone with SNIPER System attached, it is necessary to have the UAV Pilot Certificate with qualification for Critical Operations, because of the importance of the blasting operation. ATM Srl, creator and producer of SNIPER System, recommend a discretionary Training Course of 2+1 days. During these days it is set the right working procedure, shared between the involved figures, with the aim to form jointly the Blasting Team.